Of all the taut, gripping images in director Kathryn Bigelow’s exceptional Iraq War drama The Hurt Locker, one of the simplest lingers longest in your mind. Pinned down by sniper fire in the middle of the desert with a group of British mercenaries, three American soldiers endure insufferable heat for hours, waiting out – and killing – their adversaries one by one. In the stillness of their stakeout, flies conspicuously hover and nestle on the soldiers’ faces, as if these men striving mightily to stay alive were somehow already dead. 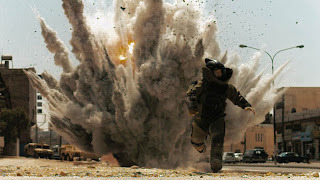 Set in 2004, Hurt Locker follows the final month in the rotation of an Explosive Ordnance Disposal (EOD) unit, or “Blasters,” whose mission is to defuse or otherwise nullify enemy mines and IEDs. Following the death of the squad’s leader (Guy Pearce, in a cameo), Sgt. J.T. Sanborn (Anthony Mackie) and Specialist Owen Eldridge (Brian Geraghty) are joined by Sgt. Will James (Jeremy Renner), a hotshot whose expertise and brazenness have helped him disarm over 800 bombs. James enjoys each disabling mission not just as a challenge, but as an almost a sexual rush that typically calls for a post-coital cigarette. A scene in which Eldridge unwinds by playing a war-themed video game evokes both the psyche of the war-torn soldier and the nature of the actual war. The Iraqi battlefield is depicted as an arid theater in which opposing sides engage in an unending, deadly game of cat-and-mouse, devoid of politics, religion, or any other animating ideology. In the arena of urban warfare, distinguishing friend from foe is both paramount and nearly impossible. An enemy could be peering from behind or atop any building; an IED could be hidden underneath any innocuous bag of garbage. For the locals, war has become a spectator sport – children fly kites from rooftops as suicide bombs detonate below. Although Hurt Locker certainly benefits by comparison to the many previous lackluster films about America’s war in the Middle East, it is no small praise to declare it the best non-documentary yet about the Iraq War. Making her first feature film since 2002’s K-19: The Widowmaker, Bigelow finally realizes her promise as a filmmaker. Filmed in Jordan, her action sequences are both austere and breathtaking – “edge-of-your seat” is an appropriate compliment. Meanwhile, the screenplay was written by Mark Boal, a journalist who spent time embedded with an actual bomb squad in Iraq (Boal’s 2004 article about the death of an Iraq War veteran was the basis for Paul Haggis’ In the Valley of Elah). The heart Boal’s script is an exploration of the soldiers’ survival instincts. In the waning days of their tour, Sanborn retreats to the safety of caution and protocols. In contrast, James faces down the enemy and its deadly devices headlong. He is either a deus ex machina or a reckless cowboy with a death wish, and the tension resides in whether his methods harm or protect his squad mates. Where Hurt Locker falters is when the focus shifts too far onto James’ growing mental and emotional volatility, triggered primarily by the discovery a bomb hidden inside the cadaver of a young child and manifested chiefly by his sudden desire to embark on seek and destroy missions for anonymous triggermen. While this allows Renner to expand on an already noteworthy performance, it disrupts the balance between the characters. The film’s title is generally a colloquialism for inflicting pain on someone else. In the context of the film, there are alternate allusions. First, there’s the crate James keeps under his bunk containing dozens of triggering devices he has previously diffused, which remind him of the number of times he has cheated death. And then there is the bulky suit Blasters wear when approaching an explosive device up close, a kind of mobile sarcophagus that is relatively ineffectual against short-range detonations at preventing pain or death. Ironically, it is also the place James feels most at peace – he even takes to sleeping in his blast helmet. Contrast that with a short scene near film’s end, in which James, temporarily States-side between deployments, visits a local grocery store to buy breakfast cereal for his estranged wife (Evangeline Lilly) and their child. James looks upon the aisle of seemingly limitless choices with both perplexity and alienation. The “real world” has lost its meaning. For soldiers like James, the only way to feel alive is to keep facing death.